We have noticed that a few people have been having difficulties starting the airplanes in the recent cold weather. It is worth it to take the time to review the Pilot's Operating Handbook (POH) for proper starting procedures. The POH has the engine start checklist, and checklists are provided for each airplane, but wait, there’s more! Look carefully in Chapter 4 of the POH. It has “Amplified Procedures” following the checklists. "Amplified procedures" are where the manufacturer has given more detail for the steps in the checklist. Remember: A checklist is just that - a list provided to help you to check to ensure that you haven’t missed any steps. The instructions and methods that should be used in performing the steps are found in the amplified procedures. ...well, you get the idea - quite a bit of time passes, the vaporized fuel will pool at the intake manifold and excess fuel will seep out and collect in the cowl and around the air intake. This fuel will no longer be vaporized and assist starting. Instead it will accumulate and feed a fire! Priming in carbureted engines should be done as the last step immediately prior to engine start! The danger of failing to prime sufficiently is that the engine will not start. The danger in overpriming is that the engine may catch fire! Clearly, the former is far easier to deal with! Engines will fail to start for 2 reasons: Too much fuel and too little fuel! While a POH may recommend up to 6 strokes of primer, this is for extreme cold! At PFC, we do not start the engines in temperatures that would warrant 6 strokes of primer without preheating the plane. Thus, even 4 or more strokes of primer will likely never be necessary. When the engine is cold, pilots should always begin with the minimum number of primer strokes and increase if the engine does not catch and continue to run. If the engine catches but does not continue to run, apply the same number of strokes of primer, but crank the engine as you push the primer in on the last priming stroke. If the engine starts but you experience roughness and black smoke, this is a clear sign that the engine was overprimed! Regardless of whether or not the engine starts, as it turns out, if the airplane catches fire, it is also a sign that engine was overprimed! Pilots must always be prepared to deal with unexpected situations and react properly. This is the purpose of training. An engine fire on startup must be handled expediently and properly to avoid aircraft damage and injury to the pilot and passengers. And, while the majority of the information here has been specific to carbureted engines, fuel injected airplanes should be primed judiciously too as they are equally susceptible to engine fires! Immediately close the mixture to idle cut off and increase the throttle to full open. If the engine was running, it will die - use the ignition switch and continue cranking. If the engine was not running, use the ignition switch and continue cranking – for the same reason listed above. Close the fuel shut off valve so that no additional fuel reaches the engine. If the engine starts during this cranking, allow it to run for at least 1 minute at moderate power. After the fire is extinguished, secure the airplane and have it inspected. 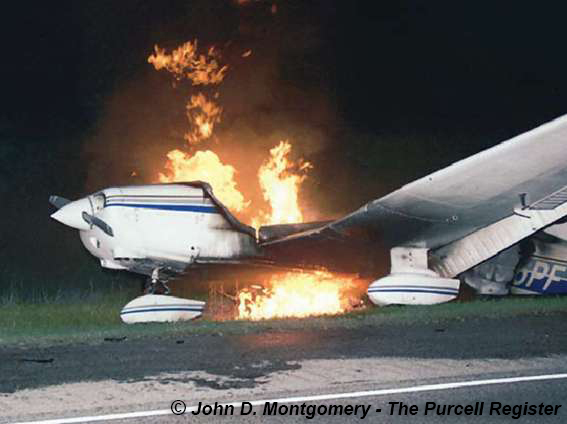 Do not fly an airplane after an engine fire unless it has been properly returned to service! If the fire does not extinguish, evacuate the airplane and summons help! Calling 911 is a good option.